In Narbonne, France, in the year 1320, a midwife and her apprentice aid a woman in the desperate throes of childbirth. The baby lies trapped in her belly and the mother is faced with a terrible decision - cut the baby from her belly or both she and the child will die. But when the child is sprung from the womb, it is evident there is something amiss with the child who is born with unnaturally white skin and odd-coloured eyes. Believing the child is from the devil, the apprentice flees with the newborn to the river where she cuts out the baby's tongue, silencing it from ever speaking the devil's words. Mute, Auda grows to womanhood in a time fraught with the dangers of the Inquisition. Her father, a scribe, skilled in the new art of papermaking, teaches her to read and write. Writing affords her an escape from the realities of her harsh life, giving voice to the thoughts she cannot speak. She aids him in producing the paper which is more affordable than parchment. Whenever he takes her out into the world, she is careful to cover her albino skin with hood and mantle for fear of catching the attention of the Inquisitors. When their new art of papermaking comes to the attention of the vicomtesse, she takes Auda into her household as her personal scribe. Auda's newfound independence leads her into trouble, however, when she is accosted by a mob who believe she is a witch. A young artist comes to her rescue and love soon blossoms between them. As Auda's writing grows bolder, the vicomtesse encourages her, even though her work is considered heretical and in support of the intelligence and power of women. But the arms of the Inquisition are long and Auda and her father find themselves captured, facing a bleak, almost incomprehensible fate at their hands. Watermark is the poignant, multi-faceted tale of a mute albino woman who must navigate a path in a world fraught with intolerance, suspicion, and fear. Vivid with description and details, from the very first chapter, the reader finds themselves immersed in the story. The art of papermaking has been carefully researched and described, relaying a strong understanding of how paper replaced parchment and ultimately changed writing and reading forever. The terror brought by the Church and the Inquisition, is also a major source of conflict within the novel and is believably represented. But it is the heart-rending tale of a horribly disadvantaged young woman that is at the true heart of this story. Papermaking and scribing offer consolation to her muteness and state as an albino, which force her to live in seclusion and on the fringes of a society who will never accept her. Through vivid language and in depth descriptions, Vanitha Sankaran nudges the emotion and credibility out of the story, making the reader truly understand the complexities of this turbulent era through the thoughts, dialogues, and actions of her characters. 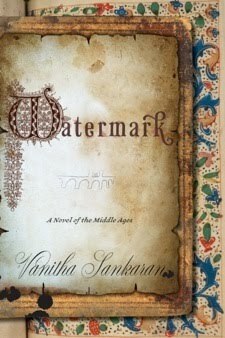 Watermark is a delightful, engaging tale about determination, perseverance, love, and forgiveness. It is horrifying how people who were "different" were treated in times past but one wonders if some of those horrors aren't still in play today....just a bit more subtlety enacted. Wow, that sounds intense. Adding it to my list of things to read!